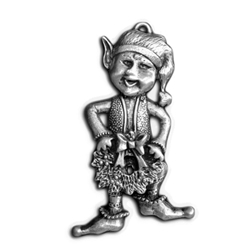 Our Santa's Elf with a Wreath Ornament measures 3 inches high and 1 3/4 inches wide. This Christmas Ornament comes with a red satin ribbon ready to hang on your tree. A mischievous little Elf holding his Christmas Wreath. Finely detailed from his stocking cap to the tiny bells on his shoes. This will make a great gift to any one to remember you every year. It is cast in lead free pewter in the U.S.